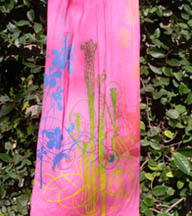 Limited edition scarf featuring three of our favorite flower designs. Product Details: 100% Fine Jersey Cotton. 93" X 16"
Sold Out. New colors and designs coming soon.